I can say that Garnier Nutritioniste Skin Renew Daily Regenerating Moisture Cream is an almost perfect moisturizer. I say almost perfect, because I believe that nothing is perfect. But Garnier Nutritioniste Skin Renew Daily Regenerating Moisture Cream is 99.99% perfect! And this is the most refreshing moisturizer that I used! It glides on easily and doesn't leave any sticky feel. Really! And to think that it's really HOT in my part of the world! Okay, the damn cream don't hold any SPF so just put a sunblock over it if you have to! 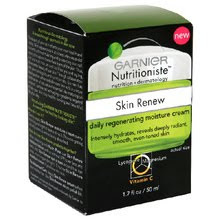 Garnier Nutritioniste Skin Renew Daily Regenerating Moisture Cream retails for about $12 in the US. It's really a good buy! Really, really affordable, quality moisturizer.